1. Preheat the oven to 200°C, gas mark 6. Bring a large pan of water to a rolling boil, add the cavolo nero and cook for 2 minutes, refreshing under cold water. Drain well and set aside on a clean, dry tea towel. 2. Heat a medium frying pan, add 1 tbsp of the garlic infused oil and fry the pancetta until crisp, add the breadcrumbs, followed by the sage leaves and continue to fry slowly until golden and crisp. 3. Toss the gnocchi in a bowl with the cavolo leaves, remaining garlic oil and dried chilli. 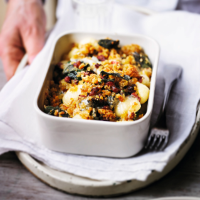 Divide between 2 ovenproof dishes, dot with the crème fraîche and the Gorgonzola, scatter with the pancetta crumbs and bake in the oven for 15 minutes until bubbling and golden. This recipe was first published in Thu Mar 12 12:28:38 GMT 2015.